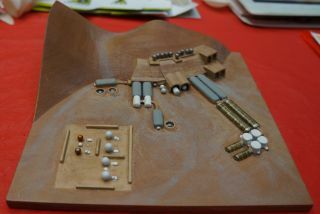 A 3D-printed concept of a Mars colony. 3D printing could be one of the core technologies a Mars colony will depend on to make spare parts and even build structures. NEW YORK — Mars pioneers could use 3D printing to create a sustainable human colony on the Red Planet, advocates say. A team of scientists is developing a plan to use 3D printing to build locally made houses and food on the Martian surface. These resources would support the lives of people leaving the confines of Earth for the Red Planet. Gears can be 3D-printed and become parts of another 3D printer. "The key for living on Mars is to use the raw materials that are already there," Mackenzie told the crowd at the 2013 World Maker Faire, a celebration of DIY science, technology and engineering, here on Sept. 22. Officials with the Mars Foundation hope to one day manufacture a Martian pipeline that can run, construct and even duplicate itself, using only local materials on Mars. The Martian building venture, called the Mars Homestead Project, is already somewhat underway. Engineers working with the Mars Foundation have examined a variety of plans, including those that explore how to manufacture oxygen and methane, the gases and fuels needed to craft plastics like polyethylene, polyester and epoxy. "From the raw material already found on Mars, we can make plastics," Mackenzie said, adding that the ability to manufacture plastic would make it possible to start building a low-cost base. The different types of plastic could then serve various purposes. They could be made into pipes for irrigating a greenhouse or used to 3D-print gears that would then go into another 3D printer, Mackenzie said. The researchers have plans to make other materials, too. Martian sand could be used to print fiberglass and cement, while greenhouse-grown corn and potato starch could go into lighter objects like spoons, saltshakers and virtually any household item that a settler might need in his or her Mars colony home. However, 3D printing on Mars may not be the best method for making all items, Mackenzie said. For bigger objects, laser-jet cutters and water-jet cutters could cut pieces from sheets of plastic, which would then be glued together. Perhaps a crew of three to six people could fly such cutters and other essential equipment to Mars and then start the process, getting things ready for the newcomers, Mackenzie said. Officials with Mars Homestead also need to figure how to keep cargos as light as possible. NASA's Mars rover Curiosity — the most recent rover to land on Mars — weighs 1 ton, but a human mission will probably involve more material — and therefore more weight — transported to the Red Planet. "It would be nice if we could land five or 10 times more [than Curiosity did]," Mackenzie said. The scientists are using Hawaii as a proxy while developing a prototype Mars settlement, examining locally produced material on the islands. This includes polymers derived from ethylene, itself made from atmospheric carbon dioxide. Researchers are also examining plant products and fiberglass that can be used for unpressurized shelters or covered with dirt to hold the pressure. Email Bahar Gholipour or follow her @alterwired. Follow us @Spacedotcom, Facebook and Google+. Original article on SPACE.com.